Eclof Colombia was founded in 1986 and is part of the international organization “Eclof International” (active in 19 countries on 3 continents). 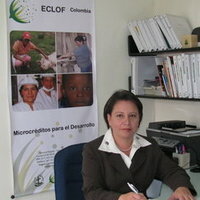 Eclof Colombia has its headquarters in Colombia and 3 branch offices in the region. A team of 23 people, including 11 loan officers helps approximately 1800 clients. Maria Victoria Aguirre, who has a vast experience in financial services, is Eclof Colombia’s Executive Director and is responsible for the whole SME portfolio. A strict security policy in Colombia in recent years has paid off. The Colombian economy is growing. The image of Colombia has not always been positive. For over 40 years the country has been plagued by armed domestic conflicts. However, the strict security policy has resulted in a steady growth of the GDP with over 3 per cent since 2010. Additionally, the number of foreign investments has increased.